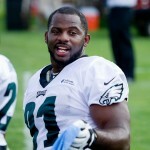 Which Eagles Free Agents Will Be Back? We’ve started to preview free agency in the past few days with breakdowns of the cornerbacks and the safeties. And we’ll continue to look at other positions the rest of the week. 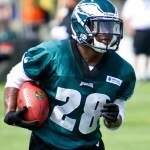 But for now, here’s a peek at the Eagles’ own pending free agents, with some thoughts on who could be back. The following Eagles are inactive for today’s game against the Giants: Greg Salas, Chris Polk, Danny Watkins, Matt Kopa, Evan Moore, Fletcher Cox and Mychal Kendricks. The following Eagles are inactive for today’s 1 p.m. matchup against the Redskins: Michael Vick, Greg Salas, Chris Polk, Stanley Havili, Darryl Tapp, Danny Watkins and Matt Kopa. 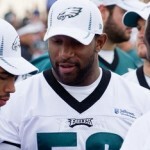 Eagles DL Production: Cox, Cole And Graham In 2013? The Eagles’ defensive line turned in its best performance of the season Thursday night against the Bengals. Brandon Graham had a career game. Trent Cole looked like the old Trent Cole. Fletcher Cox continued an impressive rookie campaign. And guys like Cullen Jenkins and Cedric Thornton contributed as well. In all, the defensive line combined for six sacks and eight hurries. Andy Dalton was under constant pressure and completed just 13 of 27 passes for 127 yards. In a future post, we’ll break out the All-22 and look at why the Eagles defensive line was successful. But first, the player-by-player breakdown. 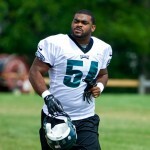 Eagles DL Production: Success Without Washburn? Sunday’s game against the Bucs was the Eagles’ first in two years without defensive line coach Jim Washburn and the wide-nine. Tommy Brasher was hired on Monday and had three days of practice to switch up the Birds’ scheme up front. The Eagles struggled to get to Josh Freeman for much of the day, although the defense as a whole played better. Below is the player-by-player breakdown of sacks, hurries (tracked by the team’s coaches), opportunities (Pro Football Focus) and pressure percentage (frequency with with which each player notched a sack or hurry). In the next couple of days, we’ll try to take a look at how the linemen were aligned up front with the All-22. DL Production: Graham Getting It Done? The Eagles’ pass-rush had some good moments early against the Cowboys, but was non-existent in the second half when Tony Romo completed all 10 of his pass attempts. After the game, Andy Reid announced that the team was parting ways with Jim Washburn, although he admitted that the game’s results had little to do with his decision. Meanwhile, Brandon Graham got the start for Jason Babin, and Vinny Curry was active for the second time this season, as the Eagles went with a 10-man rotation. Here’s the weekly look at production. Hurries (and tackles) come directly from the Eagles’ coaching staff. Pass-rushing opportunities are tracked by Pro Football Focus. And the last column is from me – a measure of how often each defensive lineman notched either a sack or a hurry. Here’s our weekly look at the Eagles’ defensive line production. The Eagles had quite a few “close but no sack” moments against Robert Griffin III. In fairness to Jim Washburn’s unit, Griffin makes defensive linemen look silly on a weekly basis. Here are the numbers. Sacks, hurries (a stat kept by the coaches) and pressure percentage (frequency with with each player notches a sack or hurry, given the opportunities). Amid a season of disappointment, Eagles rookie Fletcher Cox is providing a bright spot. Here are some plays that stood out after having looked at the All-22 tape of the Eagles’ defense against the Cowboys. Here’s an All-22 look at the issues plaguing the Eagles’ pass rush, with a focus on last week’s performance against the Falcons. The NFL trade deadline will likely come and go today at 4 p.m. (EST) without much of a splash. What are the chances the Eagles make a deal? The answer is probably slim, but don’t rule out the possibility altogether. 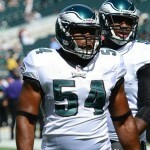 Eagles DL Review: Where Are Cole And Babin? Through seven games, it’s official: Any conversation about why the Eagles are struggling has to include a mention of the defensive line’s lack of production. It’s true that sacks aren’t everything, and that the front four can affect the game in other ways. We’ve shown that with the All-22 on several occasions. But Jim Washburn’s group just hasn’t been good enough, and the lack of production has been stunning when you consider pretty much the entire organizational philosophy was built around getting pressure from the defensive line. D-Line Diagnosis: Where Are the Sacks? When asked last week why the Eagles’ defense has been unable to come up with more sacks, Todd Bowles pointed to four specific things. Today, let’s take a look at those four things individually. DL Production: Time For Graham To Get More Snaps? Going into last week’s game, the Eagles appeared to have a big advantage with their defensive line going up against the Steelers offensive line. But when the teams actually played, Jim Washburn’s group didn’t have much of an impact, failing to get to Ben Roethlisberger and giving up big plays in the run game all day long. So what happened? Here’s the weekly review of the Eagles defensive line.